HIV and Aids... What is it? 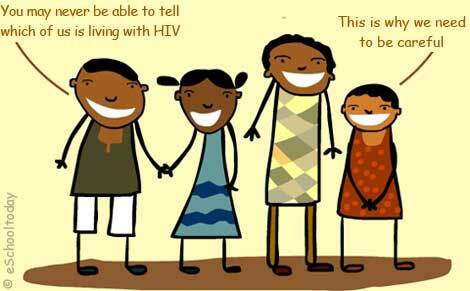 Have you met someone living with HIV? Maybe not. This is because HIV itself does not show on anyone. People with HIV may look very strong, pretty or handsome. Others also hide their status for fear of people treating them differently. This is why the subject of HIV is very interesting. Another reason is that it has no known cure, and is mainly a disease for grown ups, that means learning about it now will mean HIV shall be under control in future. Since the discovery of the virus more than 20 years ago, millions of people throughout the world have been infected with HIV. Most are adults, but there are kids and teens who have HIV, too. In the world today, AIDS remains an epidemic which means that it affects a large number of people and continues to spread rapidly. Right now, about 40 million people in the world are living with HIV infection or AIDS. This estimate includes 37 million adults and 2.5 million children. Over 60% of people living with HIV are in sub-Saharan Africa. Let us start by learning some basic things about HIV and Aids. Copyright © 2006-2016 eSchooltoday in association with BusinessGhana.com.